The Return of Farm Crush Friday: Soil Sisters Celebration!! If you haven’t figured it out by now, I’m not just a blogger who loves to eat. I am a CSA vegetable farmer who happens to also be a food blogger. And you guys, I absolutely love it. Vegetables, sunshine and hard work make up a substantial portion of my life. Some days it’s hard and some days I’m really tired, but honestly, no matter how exhausted I get I feel so honored to be able to work the land my family has farmed for almost a hundred years in completely new and innovative ways (with the Carrot love of my life!). And I feel even more honored to be trying out this farming thing in South Central Wisconsin; in a part of the state with a well-established community of growers who not only know of one another, but who also believe in sharing, educating and collaborating with one another. Yes, I am a lucky, lucky girl. Back in 2012, many, many years before I was a Leek and one year before I was a farmer, I learned of this cute little group of women in Green County. It was a group of rag-tag farming women, wanna-one-day-be farming women and women who wanted to change the face of agriculture in this great state. They got together several times a year for potlucks. They ate good food and shared their lives with one another. They shared their farming dreams and their farming struggles. They talked. They listened. They inspired one another. It sounded beautiful. But alas, I was a young girl in the “big” city of Madison. I dreamed of being a farmer but who was I to join a group like this?! My farming dreams seemed decades off. It was too grand, too scary, too much to imagine that I could possibly start a farm at the age of 22. I was simply a wanna be, so I skipped the potlucks. Fast forward three years. I’m a farmer. I’m not a wanna be. Our farm is ten miles from Green County and I joyously attend every potluck I can find the time for. I’ve met some truly wonderful women. And I’ve listened and I’ve learned and I’ve taken in as much as I can from these wise farming ladies who know how to make their dreams happen. One of the dreams of one of the founders of the Green County Women in Ag potluck group was to have a weekend-long celebration of women farmers with workshops, dinners, demonstrations and farm tours in her innovative and inspiring corner of the state. Lisa Kivirist began Soil Sisters as a tour of farms in the Green County area in 2012. It was one day. You could visit four or five farms. It was modest, but well-attended. In three short years, it has become the event of her dreams. She received a grant to make Soil Sisters much grander with more events, more farms, and more happenings. This year, it will be a full weekend celebration of Green County farms and rural life! Read on to learn more about this spectacular event from Lisa Kivirist herself! And stay tuned each week as I interview a new “Soil Sister” for Farm Crush Friday until the big event begins! As July 31st approaches, I’m getting pretty excited for a whole weekend of farms, food, strong women and crazy animals. Can you tell my readers a little bit about the upcoming Soil Sisters weekend? Sure! I’m excited too. Soil Sisters: A Celebration of Wisconsin Farms and Rural Life showcases the Wisconsin women farmer movement by offering to the public an immersive farming and culinary experience, led by women – the “soil sisters” — committed to a healthy, fresh product or farm-made, artisanal food products and other items. The event starts July 31 with an intensive on-farm workshop and culminates with the Tour of Farms on August 2, 2015. Help preserve the harvest, go on a hayride, spin some fiber, milk a goat, or just relax in a tree swing. There’s something for everyone. Folks can pick and choose what events they would like to attend, including a Dinner on the Farm, Taste of Place culinary event, plentiful on-farm “Green Acres” fun and educational workshops, plus area restaurants featuring “locavore” specials throughout the weekend. The Tour of Farms is on Sunday, August 2 with eight different women-owned farms open for tours. From heirloom tomatoes to emus, sheep to solar energy, bed & breakfasts to beef, the farmers and artisan food producers share a unique diversity of farm experiences showcasing the summer’s bounty. At our farm, Inn Serendipity, we’ll be hosting two workshops on Sat. Aug. 1: How to start a food business from your Home Kitchen and, just for fun, a Cucumber Foot Soak Spa. Stay for the Dinner on the Farm Saturday night and then come back for the Tour of Farms on Sunday. What a huge affair! Has this always been a weekend-long event? Soil Sisters will amplify for the first time in 2015 to a full weekend long event! The tour portion started in 2012 and, thanks to continued growth and support, grew to a regional tourism event. We’re excited to offer a full line-up of activities over the weekend, from workshops on Friday, July 31 and Saturday August 1 to culinary events like Taste of Place at Cow and Quince to the Tour of Farms on Sunday, August 2. How did this all come into being? A group of women farmers from South Central Wisconsin, primarily Green, Lafayette and Rock Counties, started to gather regularly for potlucks five years ago. What started as and still operates as an informal network of friends now also serves as a strong source of support and inspiration for nurturing the organic and sustainable agriculture in our farm-hood. In 2012, under a small Youth Educator Grant from SARE (Sustainable Agriculture Research & Education), eight women farmers from this group launched the Soil Sisters Tour of Farms, which is what folks can experience now as a full weekend of activities July 31 through August 2. And why feature only women farmers? Women are one of the fastest growing segments of new farmers, both in Wisconsin and nationwide. This growth of new female farmers is fueled by women like Lauren Rudersdorf of Raleigh’s Hillside Farm (!!) and many of the other women involved with Soil Sisters. These women are committed to local food and raising fresh, healthy fare for their communities. While all the workshops on Saturday, August 1 are intended for the general public and anyone can attend, we do have one special session on Friday dedicated to women interested in starting their own farm operation: In Her Boots: Sustainable Agriculture For Women, By Women. 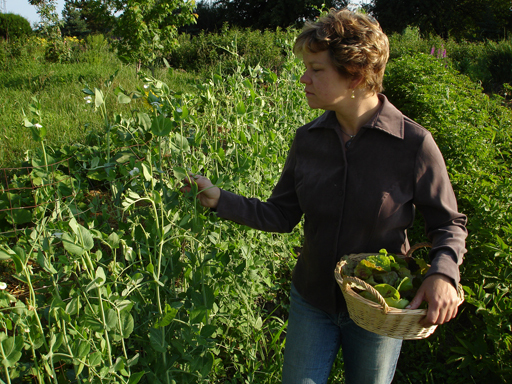 This day-long, on-farm intensive session will be hosted by Katy Dickson of Christensen’s Farm in Browntown and facilitated by the Rural Women’s Project of the Midwest Organic and Sustainable Education Service (MOSES). All women with beginning farmer dreams are welcome to attend the Boots workshop. How did the farms get selected for this event? The farms involved are involved with our local South Central Wisconsin Women in Sustainable Agriculture potluck group. Soil Sisters is a project of the Wisconsin Farmers Union Foundation and we are all WFU members as well. Do you have to be a woman to attend? Not at all; everyone is welcomed to attend the Soil Sisters events — males most definitely included! In fact, we created many events specifically for families to encourage kids to connect with farms and their food sources. You can read a sample family-focused itinerary here. Three of the Saturday, August 1 workshops are designed just for families with one ticket price covering all kids and parents. Additionally, while Soil Sisters puts the spotlight on women growers, we female farmers will be first in line to thank the men in our lives who support our collective farm operations. Most of the farms involved run in partnership with spouses, sons and brothers. True that Lisa. True that. I know I wouldn’t be anywhere near achieving my farming dreams without my incredibly hard-working Carrot husband! It sounds like there’s a lot to do. If people only have time for one event during the Soil Sisters weekend, what should it be?! That would depend on your interests and availability. Saturday, August 1st offers a range of on-farm workshops. These are truly unique opportunities to delve into a variety of activities in an on-farm setting, from flower bouquet building to pesto making. Note these workshops are ticketed and require pre-registration. There are two workshop slots: One the morning of Sat. Aug. 1 and one in the afternoon, so folks can take two different classes if desired. The Tour of Farms on Sunday August 2nd involves eight farms open 11 am to 6 pm for tours and visits, so it is a great way to see a variety of operations in one day. Note there is a bus tour option for those not wanting to drive and enjoy the beautiful Driftless scenery. There’s a cluster of four farms in the Monroe area and four in the Brodhead area. Beyond this weekend, are there any other great events coming up that folks should know about? The partner groups behind Soil Sisters offer a fabulous range of programming throughout the year, particularly for those interested in learning more about farming and knowing where their food comes from: Wisconsin Farmers Union , Midwest Organic and Sustainable Education Service (MOSES) and Renewing the Countryside. Looking at the rest of the summer, MOSES hosts various on-farm Field Days. Renewing the Countryside launches a new training program this year. It’s a great resource for farmers looking to diversify into on-farm food service: Come & Get It: What you need to know to serve food on your farm. This includes on-farm training days in August. I can’t wait Lisa. I absolutely can’t wait. I hope all your Madison-area readers find your way down to Green County three weeks from now! It’s going to be an incredible time! To learn more, visit the Soil Sisters website, read an article in Brava magazine or check out the press release for the event.